A rare recording, from 1907, of Gilbert & Sullivan's Captain's Song from H.M.S. Pinafore, produced in England by Sterling Records. Announcement "The Captain's Song from Pinafore, sung by Mr. Harry Dearth, Sterling record." Sterling Records, based in England, was run by Louis Sterling and Russell Hunting (of the famous Michael Casey series of the 1890s). 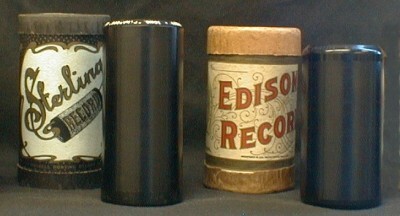 They manufactured and sold wax cylinder records from about 1905 to 1908. Sterling records featured a slightly longer record: about ¼" longer, or about 9 seconds more playing time! Comparsion of the ¼" longer Sterling to a standard Edison record. Around 1907, Sterling produced a set of at least 11 recorded highlights of Gilbert & Sullivan's 1878 comic opera H.M.S. Pinafore. This recording of "I am the Captain of the Pinafore" is sung by the well-known British baritone Harry Dearth  a remarkable name. My gallant crew, good morning. And I'm never, never sick at sea. Well . . . hardly ever! A history of Sterling Records and their H.M.S. Pinafore recordings, presented courtesy of Marc Shepherd's and his Gilbert & Sullivan Discography website.